Undergarments Revealed, 17th and 18th Century. Determined to do accurate research on my historical novels, the most difficult and interesting task was to find out what people wore under all that clothing. Many writers have erred in this area, as in mentioning “bloomers” in the eighteenth century, an item which didn’t come into use until the 1850’s. My interests are mainly in the eighteenth to early nineteenth century, but for this post I’m slipping back into the seventeenth as well. While in previous years undergarments were utilitarian, to throw off the strict hand of the Puritans, under the Stuarts underclothes took on more of a sexual allure. 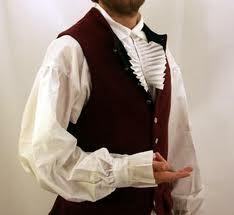 A man’s shirt became ruffled and more visible, with puffed sleeves tied in ribbons, to show him off as a fine gentleman. Women’s dresses became less rigid, and cut to flaunt pretty petticoats. The petticoat, often several of them, was worn to give the outer gown a better shape, and I’m certain, important for warmth. It was often of embroidered or ruffled material in bright, attractive colors. Poet Robert Herrick wrote in 1650: A sweet disorder in the dress kindles in clothes a wantonness. Beneath their dresses, next to their skin, women wore chemises or smocks made of Holland, and heavily perfumed to diffuse body odors. Sleeves were long and sometimes trimmed in lace. 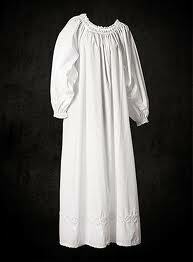 In the 1660’s dress sleeves were shortened to reveal the evocative chemise. Silk and linen were also popular materials because they harbored less vermin than wool. Wool fell out of favor, prompting Charles II to legislate that everyone must be buried in wool garments to promote the British wool industry. 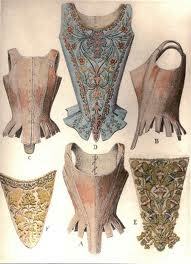 With the extreme décolletage of the gowns, corsets or “stays” had no shoulder straps. 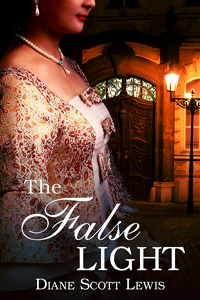 The corset was heavily boned with a long busk in front and was laced tightly at the back. People of the time commented that young women were foolish to want such “whalebone prisons” for fashion, and left themselves open to consumptions. Drawers, what we know today as underwear or knickers, were worn by French women, but there’s no evidence that Englishwomen wore such an item in this era. Although a country race where women ran to win a new smock said the girls wore half-shirts and drawers. So it is still a mystery. In the eighteenth century the hoop came into fashion again, reminiscent of the farthingale of the sixteenth century. These pushed out dress skirts and the women walked holding them to one side like a bell to reveal their fancy under-petticoats, and the shape of their legs. This must have been dangerous considering the women wore no knickers. The hoop or pannier, especially in Court dress, pushed the sides of gowns out to ridiculous proportions where women had to walk sideways to fit through doors. Later in the century, panniers became narrower and the corset lighter, lacing in the front as well as back. Men still revealed their fancy shirts by leaving their waistcoats unbuttoned to attract the ladies. Men’s drawers are another mystery. Some reports have them wearing such items—a loose fitting garment that tied at the waist and on each leg—but other sources say that men wore long shirts that covered their privates in their breeches. 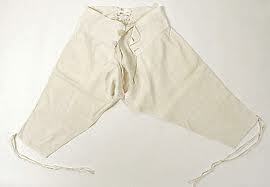 Breeches had linings of detachable washable material, which no doubt served the purpose of drawers. During the French Revolution after 1789 the classic style pervaded, and women discarded their corsets and confining gowns for simple, high-waisted Greek style chemises. Many women dampened these dresses to show off the fact they were naked beneath. It would take the stringent Victorian age to turn fashion to a more modest level and bring back restrictive undergarments. Information garnered from my own research and The History of Underclothes, by C. Willett and Phillis Cunnington, 1992 edition. Check out the results of my research in my debut novel, adventure and romantic elements in eighteenth century England. Great blog post, Diane, I read a funny article about the actors being made to wear Edwardian underwear in Downton Abbey, which was far looser than today's styles. Thanks,Maggi! That is amusing about Downton Abbey, but it makes you "feel" the part. Those long white shirts as shirt, nightshirt at times, and liner between skin and breeches takes a bit of the romance away, eh? The washer woman knew far more than she cared too about the master's bathing and hygiene habits! I also saw an article where Elizabeth McGovern enjoys the change in undergarments now that they are in the 20s. Would you agree that the lower class women wore corsets that attached in the front and probably had boning but less of it? I read a lot of Samuel Pepys. He wore two shirts during the winter to keep out the cold. Once he engaged a dance instructor for himself and his wife. In the month of lessons Pepys found his wife too friendly with the instructor. As a result, he would watch his wife dress in the morning, taking particular notice if she put on her 'drawers'. Very nice post. I love learning about underclothing. Excellent discourse. I've needed to know this for my books. Truly said previously clothes were manufactured such that both men and women were comfortable wearing such clothes but today also there are some companies who manufactures clothes like undergarments and stuffs which smooth, comfortable for men and women.